Can’t decide between cookies or cake? Make BOTH! 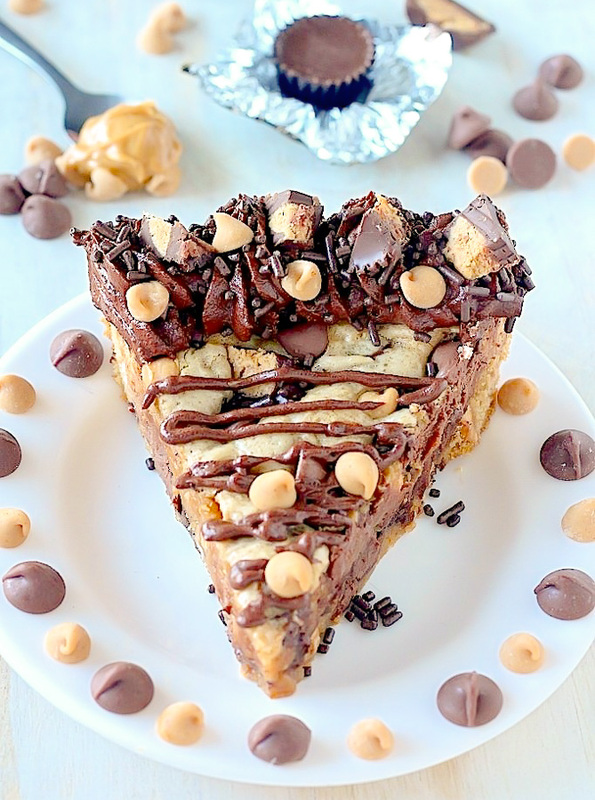 It’s easy with this peanut butter chocolate chip cookie cake!!! 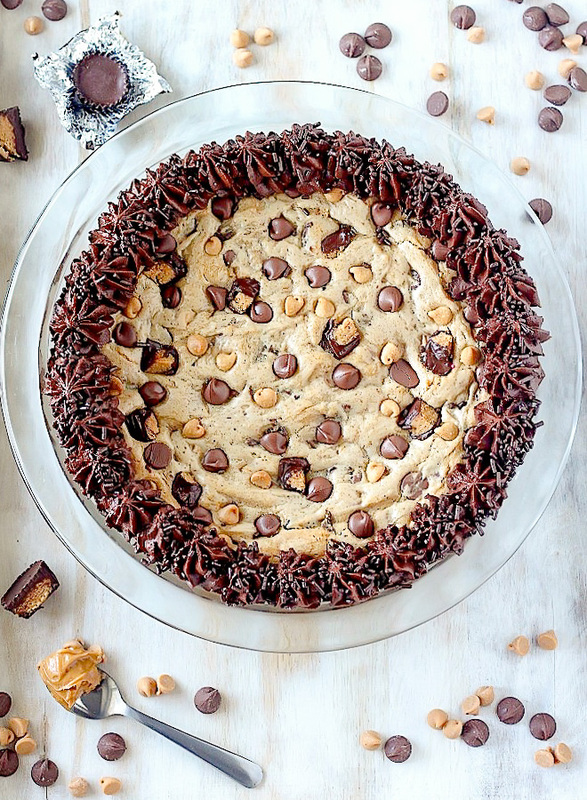 A giant peanut butter cookie packed with chocolate chips, peanut butter chips, AND peanut butter cups… trust me – this is one cake you don’t want to miss. Greetings from the beach! We’re on vacation this week (hence the slower pace of posting), and I have to say, it’s been very easy letting the laid-back beach life takeover. We’re staying in a super cute house right on the bay, and in between the napping and eating and EATING (omg the eating! ), well, let’s just say life is gooooood. Also, I miss you guys! I have some great stuff stored up to share, but um, the wifi here is fickle as a pickle, so I’m sort of working with what the internet situation allows. Question: Do you have any late Summer trips coming up? I find August is a big vacation month! The GOOD news: YOU can make an AWESOME cookie cake at home for WAY less $$$ and VERY little effort. Woo-hoo!!! Let’s get excited. Let’s shout it from the rooftops! Ok. Now that we’ve covered the “this is exciting” part, let’s move on to the specifics. The base of this cake is a thick, chewy, soft-right-in-the-center peanut butter cookie that’s LOADED with goodies. These goodies are chocolate chips (you could use chunks here, too), peanut butter chips, and chopped up peanut butter cups. Yes. All those in one cookie cake! Can you say Yum-may?! Preheat oven to 350 degrees (F). Spray a 9-inch pie dish lightly with nonstick spray; set aside. In a large bowl using a hand-held mixer or in the body of a stand mixer fitted with the paddle attachment, beat the butter and peanut butter on medium speed until completely smooth. Add the sugars and continue to beat on medium speed until creamy; about 1 minute. Add in the eggs and vanilla, increase speed to medium-high, and beat until combined, scraping down the sides and bottom of the bowl as needed; set aside. In a separate, medium-sized bowl, combine flour, baking powder, and salt. Turn the mixer on to low speed and carefully add the dry ingredients to the wet ingredients, beating just until combined. Using a rubber spatula stir in the chocolate chips, peanut butter chips, and chopped peanut butter cups. Pour the cookie dough into the prepared pan and use the spatula to spread it evenly around the pan. Bake for 23-25 minutes, or until the center is almost set and the edges are golden. Once removed from the oven, allow cookie cake to cool completely. Once cooled, use a sharp knife to loosen the sides of the cookie cake and transfer to a serving dish; alternately you can serve the cookie cake directly from the pan. Sift together the confectioners' sugar and cocoa powder, pressing it through a small sieve and into a large bowl to assure there are no lumps left; set aside. Beat the butter on medium speed until smooth and creamy; about 2 minutes. Gradually add the sifted sugar/cocoa powder alternately with the milk. Stir in vanilla and salt. Once all of the ingredients have been added, beat on high speed until creamy and combined; about 2 minutes. Decorate the cooled cookie cake with frosting and chocolate sprinkles. This. Looks. Amazing. Girl you’ve outdone yourself! Oooooeeeeeeeeeeeeeee!!!! My husband would DIE over this!!! Have fun at the beach! Totally jealous!!! Yes please, I need this cake to satisfy all my chocolate PB cravings! OMG this looks ridiculous! Everything I love in one giant cookie/cake! Glad you’re having a nice vacation! Just INCREDIBLE!! You always amaze me! My family would go crazy for this cake! This cookie cake looks perfect for entertaining guests or a birthday party. Wish I was on the beach this week too! 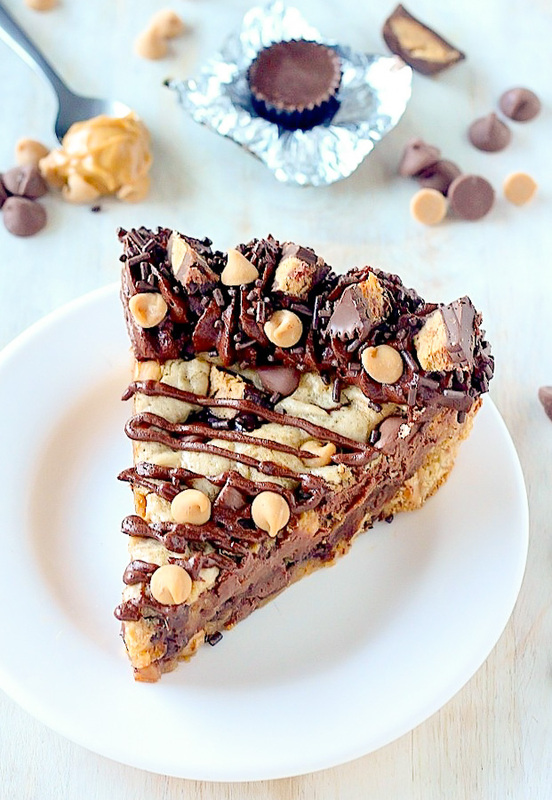 This absolutely looks like the ultimate cookie cake.. ever! Amazing!!! Hi Jessica! Thank you 🙂 It’s sooooo yummy! I am currently shielding this post from the.boy lest he instruct me to get in the kitchen and make it immediately! Not that I would really mind…because whoa. This is awesome. Holy cow! This is my kind of cake….or should I say my kind of cookie! I love that I no longer have to choose between cravings. 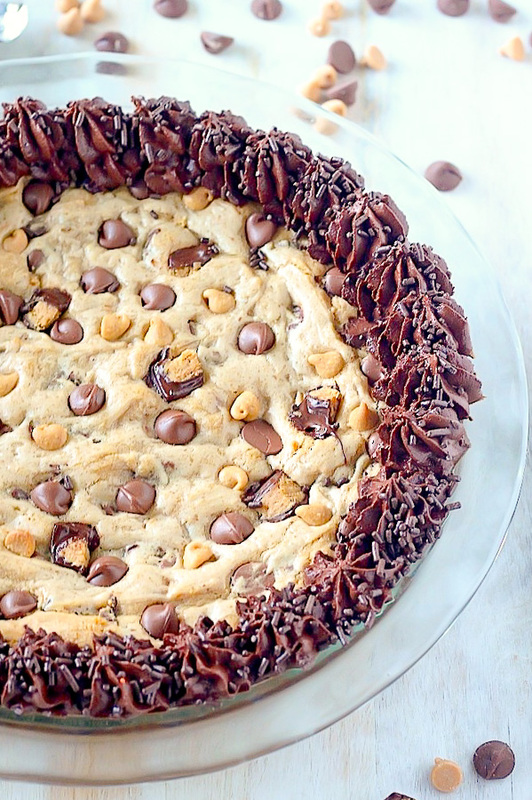 This cookie cake has it all! You weren’t kidding when you called this the “ultimate” cookie cake! I feel like I gained 5 pounds just by drooling over the pictures, yum! Way better than any mall cookie cake! When you say 1/4 peanut butter. Do you mean 1/4 of the jar or a cup? Was wondering how to store this. Made it the day before a party and need to know if I should leave it out with the frosting on it or put in fridge? Hi Christine. In the fridge or at room temperature will be fine. The icing has enough sugar in it that it won’t spoil. This is so beautiful! Do you mind telling me what type of tip you used to pipe on the frosting?? It looks great! This looks gorgeous!! I was thinking of making it for a friends birthday but I live in Australia and we don’t have peanut chips over here 🙁 only choc chips and caramel chips. can you think of anything I cant replace it with? Hi Natalie! I think using just chocolate chips will work great 🙂 The cookie cake itself has peanut butter in it, so you won’t be missing out on much! 1 what of semi sweet chocolate chips? Package? Cup? Hi Jolene. Ooops! 1 cup – off to fix that now! Looks delicious. I am about at the end though and realized there were no directions about where to add the sugar so I almost left that out and even before adding it is very dry. Not something I will be able to pour. Is there a wet ingredient missing or is 2 cups flour not right? Hi Dorthy. The batter is very thick, but you should be able to smooth it into the pan with the help of a spatula. I make my husband a chocolate chip cookie cake every year for his birthday, it’s his absolute favorite. Although this sounds and looks absolutely amazing, upon tasting everybody was rather disappointed. First off, the peanut butter is overpowering, which takes away from the cookie cake experience. Rather more disappointing, however, is how the texture is dry and crumbly rather than moist and delicious like I would expect from a cookie cake. Hi Tanwni. This cake is thick and very chewy, like a giant cookie. Did you follow the recipe to a T? I’d love to troubleshoot what went wrong with your recipe. I made this cake a few days ago for Memorial Day Weekend… oh. my. gosh. What an amazing cake! Rave reviews and just cooked to perfection. I followed the recipe to a T (room temp butter… warm eggs… you asked for it- I did it!). My only fault was that I used expired baking powder and somehow it STILL turned out amazing!! I baked this cake for exactly 24 minutes and took it out- at first I thought it would be too undercooked (which I personally love but wasn’t sure about the other consumers) but after several hours of cooling, everything was perfect. THANK YOU!